Who funded the legal battles over Nevada’s redistricting? Voters may never know. As redistricting efforts continue across the country, money from unions, corporations and other special interests is clearly having an impact — even when the redistricting process is taken out of partisan hands. After Nevada Gov. 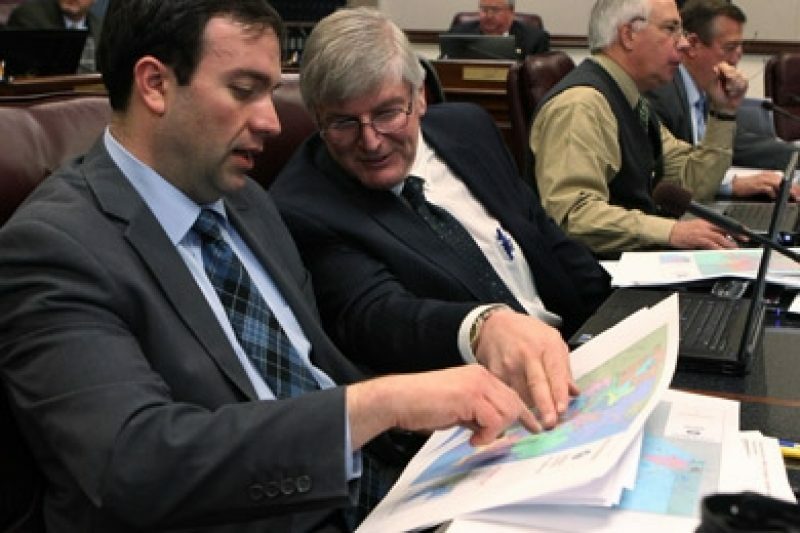 Brian Sandoval, a Republican, repeatedly vetoed redistricting maps created by the Democratic-controlled state legislature, a Carson City judge appointed a three-member panel of experts to draw new district maps. But as the Las Vegas Sun reported, that didn't mean special interests were locked out of the process. The Democratic legal efforts over redistricting were funded by a combination of state party money and funds from the National Democratic Redistricting Trust, the Sun reported. The trust, created by the national Democratic Party to fund redistricting suits, can accept unlimited money and does not have to disclose its donors. Republican efforts were paid for, in part, by the Fund for Nevada's Future, a nonprofit group that also has no limits or disclosure requirements on its fundraising. As we detailed earlier this year in "The Hidden Hands in Redistricting," such opaque groups can channel huge amounts of special-interest money into efforts to create districts that favor certain candidates — or convince others not to bother running. While the final maps drawn by the court-appointed panel in Nevada were seen as largely favoring Democratic interests, the Republican legal team did persuade the judge overseeing the process to make a few tweaks in district lines. As the Las Vegas Review-Journal reported, these changed the shape of one Republican state senator's district and slightly reduced the proportion of registered Democratic versus Republican voters in several other state legislative districts. Legal challenges against the maps must be filed in the next month. As the Las Vegas Sun noted, voters may never find out who paid for these redistricting efforts, or the lawsuits that may follow. Because redistricting takes place only once a decade, a favorably drawn district can help a politician stay in office for 10 years, while a donation to a legislator's campaign chest will only help for a single election cycle. "Redistricting has far more impact than support of any one candidate, dollar for dollar," Massachusetts redistricting expert Daniel Winslow told us. But thanks to a 2010 Federal Election Commission ruling, the efforts of redistricting groups are not considered to be "in connection" with particular elections — a ruling, secured by the National Democratic Redistricting Trust, that gave members of Congress explicit permission to raise money for redistricting without being subject to campaign-finance limits or disclosures. Following this ruling, we've documented the rise of opaque redistricting groups in Florida, Massachusetts, Minnesota and California. Nevada is another example. While congresspeople who raise money for the National Democratic Redistricting Trust and similar groups trust must seek permission from the House Ethics Committee to do so, these requests are confidential. Politico, reporting on the process this spring, identified two congresspeople who had received this permission: California Rep. Mike Thompson and House Minority Leader Nancy Pelosi. And while the Fund for Nevada's Future, which actively solicits donations on its website, does not have to disclose its donors, consultant Mike Slanker, the Fund's director and treasurer, told the Sun that the Fund also has an affiliated political action committee, which is subject to campaign disclosure rules. Slanker did not respond to requests for comment. Matthew Griffin, a Nevada attorney involved with the Democratic redistricting efforts, said he could not comment at this point in the process. In an interview with ProPublica, Mark Hutchison, a Nevada lawyer representing Republican interests, called his redistricting efforts "a labor of love" and said he was being compensated at a low rate.